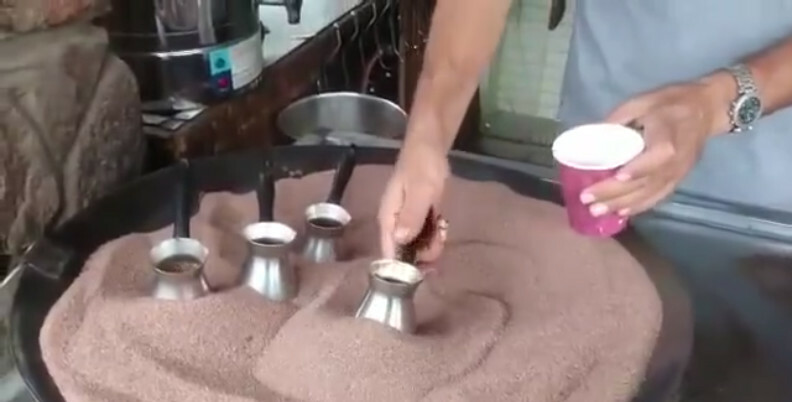 I came across this video on Facebook, which allegedly demonstrates some sort of "Egyptian Coffee" making technique. What exactly is the video showing? Where can I read more about this coffee making technique, and the associated equipment, etc? This is actually the Turkish method for making coffee, or a variant of it. Coffee grounds, cold water and sugar are brought just to a boil several times before being poured into small cups. For this method one typically uses the finest possible grind of coffee. The sand is used to control heat. The pots (called cezve) on top of the sand keep warm, and when you want them to boil you push them down through the sand to make direct contact with the hot plate underneath. Not the answer you're looking for? Browse other questions tagged coffee food-identification or ask your own question. Coffee brewing methods - scientific analysis? What kind of fuel do I use for a Hario TCA/50A coffee syphon? What makes the 'Cat poo' coffee (Kopi Luwak) flavour worth drinking?